Politics • Ex-governor toots his own horn on tax reform, wants U.S. to follow the state's lead. Republican presidential candidate, former Utah Gov. Jon Huntsman listens to questions during a meeting with area business leaders and lawyers during a campaign stop in Concord, N.H., Thursday, Sept. 1, 2011. (AP Photo/Jim Cole) File Photo | The Salt Lake Tribune Former Utah Gov. Jon Huntsman advocates a massive overhaul of U.S. tax code -- including adoption of a flat income tax with no deductions. His legacy in Utah also includes tax reform, but with lots of compromises. When Gov. Jon Huntsman signed into law sweeping income tax reform in 2006, his staff held a small ceremony, presenting the boss with a framed copy of the bill with congratulatory messages signed around the mat. In hindsight, the income tax reform was probably the landmark initiative of the Huntsman years, and now, as he vies for the Republican presidential nomination, he points to tax reform as one of the pillars of his platform. "The most important thing we can do to get this economy going today is, No. 1, we've got to reform our taxes," Huntsman said during a recent interview on "This Week." "We've got to create a competitive tax code just like we did in the state of Utah." Huntsman has proposed tax reform that would eliminate all deductions  including popular deductions for things like mortgage interest  and establish three tax rates, at 8, 14 and 23 percent. Wiping out hundreds of millions of dollars of deductions that have wormed their way into the tax code would mean taking on well-established and well-heeled Washington interests and drawing fire from both parties. "It certainly would push everybody's emotional buttons," said Keith Prescott, who had Huntsman's ear on tax issues and was appointed as chairman of the Utah Tax Review Commission. "I think it's doable given the right kind of leadership and I suspect that Governor Huntsman, of the candidates I've seen, he's the one who could do that." 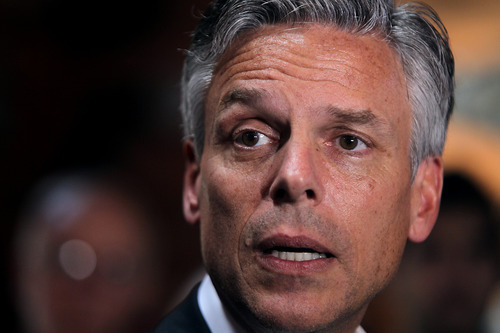 But it was a war that Huntsman opted not to wage when he was governor. By the time Huntsman took office in 2005, the issue of tax reform was already teed up. A commission, appointed by his predecessor, Gov. Olene Walker, had been studying Utah's tax code and recommended that the state adopt a flat tax with no deductions that was initially embraced by the new governor. "Huntsman was in favor of the flat tax for a day and then dropped it," said Rep. John Dougall, R-Highland, who worked on the issue. The political reality was that legislators didn't want to give up deductions. The Church of Jesus Christ of Latter-day Saints, in particular, spoke out against the elimination of charitable deductions. Prescott said he would have preferred a true flat tax without deductions. "We had something that was more stable, something I thought was more fair and was very difficult to get through the Legislature," he said. Huntsman was fairly detached from the actual negotiations of the tax package, according to the legislators involved, who said they communicated mainly with staffers. "He was always coming in with ideas and recommendations, so he's fairly creative in talking about tax policy," said Rep. Wayne Harper, R-West Jordan. "When it got down to the nuts and bolts, that's where the Legislature stepped up and took over." The end result was a tax package where the top tax rate was cut from 7 percent to 5 percent, but some deductions survived, making it a single-rate tax, not a true flat tax. But Doug Macdonald, an economist formerly with the Utah Tax Commission, said the Huntsman tax cut hurt Utah's already underfunded schools, since income taxes in Utah are dedicated to public and higher education. The Huntsman cut took more than $100 million out of that fund. Not only that, but capital gains were cut and when the economy slumped, the revenues going to education fell sharply. "It's a big deal. It's not revenue neutral, and they cut taxes at the top of the boom," he said. "If you're intent on hurting the schools  and that's what some of the people are intent on doing  then it's a good deal." Dougall sees it differently. He said Utah had one of the highest tax rates in the West and cutting the rate made Utah's economy more attractive. That meant education didn't see the short-term increases it otherwise might have, but it is paying longer-term dividends. Food tax fight • At the same time he was pushing for income tax reform, Huntsman was looking for a way to roll back the state's sales tax on groceries. "I think it is a tax that hits people in all the wrong places," Huntsman said in 2005. "We're talking about those on a fixed income, those who are retired, and I want make sure that we've got a tax regime that is family-friendly, that is friendly to all segments of society." Huntsman never got rid of the entire food tax but was able to roll back a portion, reducing it from 4.7 percent to 1.75 percent. But support seems to be building in the Legislature to restore the sales tax on food and cut income taxes. The criticism is that the food tax was stable  people buy food in good times and bad  so it is a solid tax base. Removing it has left the sales tax base more volatile. "I don't think the sales tax off of food is a great revenue policy. In fact, I think it's a horrible revenue policy. In fact, it has caused a lot of the cuts we've had to make over the last couple of years," said Senate Majority Whip Wayne Niederhauser, R-Sandy. "But it was what he campaigned on, and he followed through on it." Prescott said there is no question that phasing out the food tax did destabilize Utah's tax base, but it was an issue Huntsman believed was the right thing to do. "Governor Huntsman didn't feel the sales tax on food was fair, and he was very dedicated to that proposal," Prescott said. Lawyers, docs and money • When Huntsman was searching for a way to wipe out the rest of the food tax, one option he supported was taxing services provided by doctors, lawyers, accountants and even carpet installers, all of which are exempt from sales tax now. "Ultimately, we've got to come to grips with the reality that the service sector is increasingly a big part of our economic base and it's left out of the tax regime," Huntsman said in 2008. 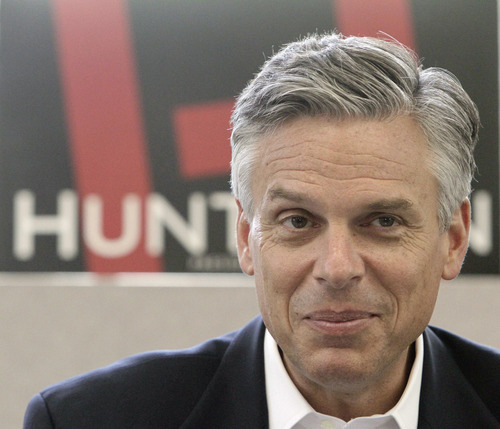 But Huntsman's flirtation with taxing services was short-lived, said Neiderhauser. "He quickly backed off it when he got some negative feedback on it," he said. "The problem with the tax on services, I think about 50 percent of the revenue generated is from medical services and that was not popular politically." Puff of smoke• Before the 2009 legislative session  his last as governor  Huntsman proposed raising the state's cigarette tax to $3 per pack, a $2.30 increase that would have given Utah the highest tax in the country. Huntsman wanted to, again, use the revenue to wipe out the rest of the sales tax on food and put more money to smoking cessation programs. Lawmakers at the time proposed a more modest cigarette hike to $2 per pack. Niederhauser opposed the cigarette tax hike that year and was instrumental in defeating it. "It's horrible, horrible tax policy because it's a double message: 'We're trying to balance the budget so please keep smoking,' " he said. A year later, after Huntsman was in Beijing serving as U.S. ambassador to China, the Legislature passed a $1 increase to the cigarette tax. R When Huntsman took office in 2005, he liked a flat tax, but ended up with a single-rate tax. • Under Huntsman, Utah's share of the food tax fell from 4.7% to 1.75%. • Huntsman wanted to tax services, but it wasn't a popular political issue. • His push for Utah to have nation's highest cigarette tax was defeated.